THANKS! Okay…well there is a bit of a story behind this card…sort of a long story so just hang in there with me. Have you ever bought something you just HAD to HAVE then well…it just sat there? Yep…that was me and the Striped Scallop Thinlit. Okay…maybe I did use it once before. Anyway, I needed to make a thank you card for a person I work with. She is the back end administrator for our learning management system and without her things would be a royal MESS!!! Not many people at my college know who she is or what an important job she has. I do! She has pulled me out of more than one mess and I am one of the fortunate people who can call her directly instead of ‘going through the chain of command’. It’s been an interesting summer and at least 5 messes she has gotten me out of with our new system. So I want to send her a thank you card. So I sit down to stamp and NO IDEA what I want to do but I found this sketch from CASE this Sketch and then this FABULOUS color combo from colourq and I just KNEW I could combine them into something COOL for Kathy! Anyway, I’m staring at the sketch trying to figure out how to create the background and the Striped Scallop Thinlit pops into my mind and all I can say is after that…the card sort of just made itself! LOL…don’t you LOVE when that happens? I do! Whisper White THICK cardstock – 4 1/4 x 5 1/2, cut out with the Striped Scallop thinlet. I played with this piece until I figured out what part I wanted to use because I knew I was going to cut some of it off. Once I did figure this out, I cut off the excess and attached it to my card front. To make the scallops, just use the Striped Scallop Thinlet again in each of the colors. Instead of the whole sheet you can run through side by side half sheets because the most I used for a color was 8. Add scallops in Calypso Coral, So Saffron (had to substitute this for Apricot Appeal), and Delightful Dijon (a sub for More Mustard). Whisper White – 1 1/4 x 3 3/4. Stamp greeting in Night of Navy, cut end using the Lots of Labels Framelit, punch 1/8 hole in end, and add Calypso Coral Thick Baker’s Twine. Fray the edges. If you are looking for some great ideas for products from the NEW Stampin’ Up! 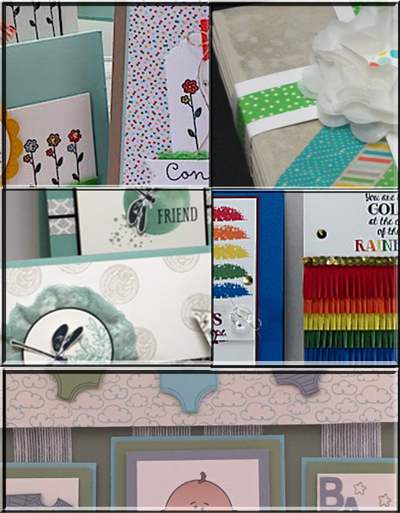 catalog then the Create with Connie and Mary July 15 mini session is for you! A mini session includes the tutorials for FIVE projects with full step-by-step tutorials for THREE card sets and TWO 3D items. AND we are showing ‘snippets’ of the projects and letting you know what sets we used! Here’s what we did for July! All this for only $8.95! Projects will be available July 26th and you will get ALL 5 ideas right away…no waiting! So head over to Create with Connie and Mary to sign up now! This entry was posted in Challenge and tagged Fabulous Four. Bookmark the permalink. I love this card! I think it’s so much fun to piece things together like this. I don’t have the scallop thinlets, but I do have the honeycomb and would love to give this a try. Love your story, too. What a cool die! Fabulous take on the sketch! Lovely, Mary. How did you get the scallops from the colored card stock? Cut 4 more Scallop Thinlets in the four colors and used the pieces that pop out? Or ???? Dying to know as this is so beautiful! You guessed right…I cut the scallop thinlet 4 times – white for the frame, then Calypso Coral, Delightful Dijon and So Saffron for the inside scallops. Glad you all like the card. I was so happy with the way it turned out too! I love this! What a great design! Thanks for playing along at Colour Q! Beautiful card, Mary, did you glue those down, if so expertly done. Thanks for sharing your card with us at the colourQ.